MSI have carved out a following for their gaming orientated products and the TOMAHAWK B350 falls in place as part of the 'Arsenal Gaming' line, (as expected from a product named TOMAHAWK). 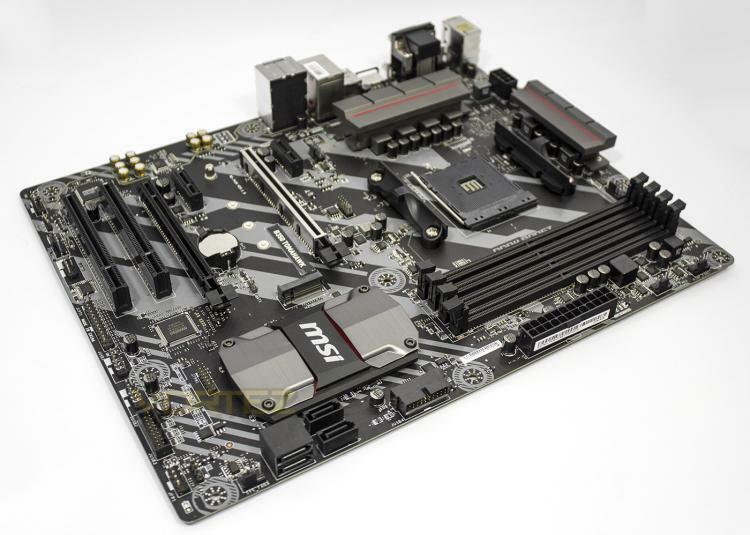 Making use of AMD's B350 chipset, as opposed to the flagship X370, this motherboard is more for gamers and mainstream users looking to create a system that doesn't quite need the additional extras found on the enthusiast platform. Ultimately what this means to the end user is that there are fewer Storage and USB options available. However, aside from the fancy plastic dresses that are now commonly found on high-end motherboards, the TOMAHAWK B350 still features new technologies and high grade components to fully utilise the latest AMD Ryzen CPUs. It includes an array of USB 3.1 Gen 1, including a Type C at the rear. The main 16x PCIe slot features a reinforced 'Steel Armour' housing, heavy duty heatsinks for effective cooling, and other electrical protective measures falling under the ever evolving 'Military Class 4' and 'Guard-Pro' collection of technologies. Specifically for gamers, MSI has loaded the TOMAHAWK B350 with features such as high grade audio featuring dedicated PCB layers, de-pop protection, Nahimic 2 software with virtual 7.1 surround. The board itself features red LED lighting along with an RGB LED header which can be controlled via the Mystic Light Sync app which is compatible with many other RGB products from various gaming brands, ensuring that your system will have a uniform theme from chassis to desktop. Other technologies include low latency LAN with a network management app, 2x dedicated Gaming Device Port (low latency, low noise USB ports), Game Boost (1-second overclocking software), additional support for VR devices, and for the streamers they even throw in a voucher for a premium X-Split licence. Finally, should you want an alternative aesthetic, the TOMAHAWK B350 is available as an 'Arctic' version, with white LEDs.